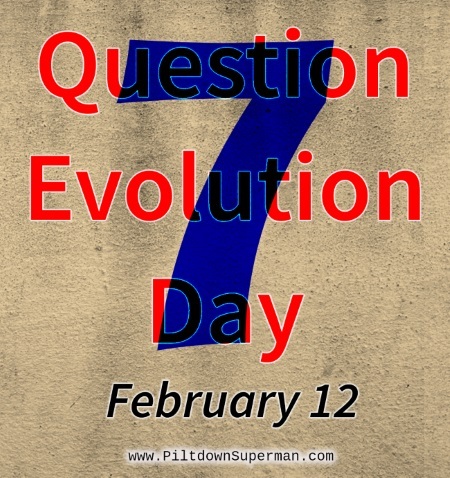 The subject of this post is very fitting for the seventh annual Question Evolution Day, but it is very important for Christians, creationists, Intelligent Design proponents, lovers of intellectual and academic freedoms, and other people. There is some startling information in the main post that will be linked, exposing the blatant hypocrisy of the evolutionary establishment. Although that 1995 article focuses on academia, many of the principles apply to the persecution of Christians, biblical creationists, and others. Since it was written, things have only grown worse, and atheo-fascism is increasing. Students who believe in creation science or Intelligent Design (which is not creation science) are advised to keep mum about their lack of belief in evolutionism lest they be denied advanced degrees. It is difficult for a creationist student to keep his or her integrity and also write an assigned paper on evolution. Indeed, some academics believe that it is perfectly acceptable to persecute creationists, deny tenure to professors, and even retroactively remove awarded degrees! Someone who does quality work, meets the standards, earns a degree only to have it rescinded on theological grounds (rejecting the religion of evolutionism) should at the very least receive a refund for tuition and fees. Strange to say that Christians and creationists are the persecuted minority class; bigotry is allowed and has no reprisals. Some creationists have received threats of physical violence and even death. Someone may ask, "Why don't the students or professors file charges? Religious discrimination is illegal". Yes it is. However, laws are useless if they are not enforced, and it is culturally and politically justified to persecute creationists. People with materialistic presuppositions assume that a creationist has an erroneous view of reality via the fallacy of ipse dixit. Atheism and materialism are irrational and incoherent, and reason is left tied to a chair in the saloon while circular reasoning is in control: since someone rejects our atheistic worldview where we define reality according to our paradigm, that person is dishonest or even insane. So much for "tolerance"! Free speech is mighty fine, as long as it fits the views of those in power who use arbitrary definitions and assertions. After all, evolution must be protected from scrutiny; it would not do to have people actually questioning evolution and seeing its flaws. Worse, some people are seeing that science and Scripture support recent creation and the Genesis Flood. Perhaps fear of thought is a reason that some universities actively ban presentations of creation science by students as well as by instructors. After all, it puts a damper on their indoctrination of students.) Sounds a bit like the Soviet Union, where anyone teaching in a university was required to sign an affirmation of atheism. When secularists paint us with a broad brush, saying that we are "fundamentalists" (a once valid word that has become a pejorative) and indicating that we all think and act alike. Labeling with illogical, emotive words is used in lieu of actual thought and rational discourse. Perhaps one reason we are a threat to secularists is because we promote critical thinking, and people who are able to discern logical fallacies are more likely to notice emotional manipulation when it is employed. Those people who label Christians, creationists, and ID proponents (essentially anyone who denies Darwin) often imagine what we may do (sometimes citing the actions of oddball professing Christians in a sweeping generalization), therefore we become dangerous in their minds. In a way, we are dangerous — but not physically. Instead, we are "dangerous" according to the thought police of leftists and atheists, because we take a stand for what we believe, and have science supporting our contention that evolution is wrong. The Creator exists, and he has made himself known. This means we are accountable to him, and there is a final Judgement. Journals operated by atheists, leftists, and secularists in general tend to downplay or even ignore overt discrimination against Christians. This is in stark contrast to the abundance of reports of this very thing reported in Conservative and Christian journals. The secularists do damage by selectively reporting and ignoring material that interferes with their narratives. The "alternative media", which includes weblogs, social media, and other things, is important. We can get present information that is suppressed by the secular science industry, atheists, evolutionists, and the like. It also means that people like you and I have voices. (I work for a living, and do not make money doing this.) You can share this post, others like it, to support Question Evolution Day as well as intellectual, academic, speech and thought freedoms. Maybe if I let you read this fascinating report (heavily researched, with 83 supporting references), that will help motivate you. Also, there's an excellent video below. The writer interviewed over 100 persons who were active in what is known as the creation-intelligent design movement. Most felt that the standard evolutionary paradigm of origins was inadequate and should be ‘balanced’ with alternative positions. The creationists interviewed differed considerably relative to their views of origins, and about half would be identified with the seven day literal 24-hour day non-gap universal Noachian deluge creationist position. Almost all felt that they had faced serious religious discrimination in their academic careers at least once or more often. The discrimination ranged from derogatory comments to denial of tenure or an earned degree. The writer also reviewed the literature and interviewed about a dozen academic deans and department chairs in the field of science. All, without exception, felt that openly holding a ‘scientific creation’ worldview would seriously impede or terminate an academic career. Many openly stated that they would not hire or support the candidacy of an out-of-the-closet scientific creationist for a tenured position in academia. To read the rest, click on "Contemporary suppression of the theistic worldview".